Hollywood is Dead » FULL-SIZE LIVING DEAD STRIKES BACK MOVIE POSTER NOW AVAILABLE! 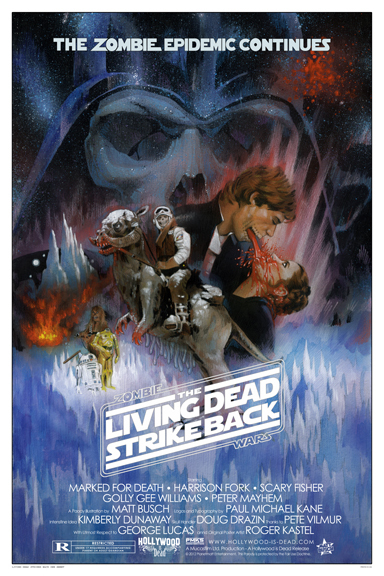 FULL-SIZE LIVING DEAD STRIKES BACK MOVIE POSTER NOW AVAILABLE! Hollywood-is-Dead has just released a full-size movie poster print for THE LIVING DEAD STRIKE BACK! This marks the first time one of these zombified parody posters has been offered at 24″ x 36″, and what a better poster to have than the ZOMBIE WARS fan favorite. 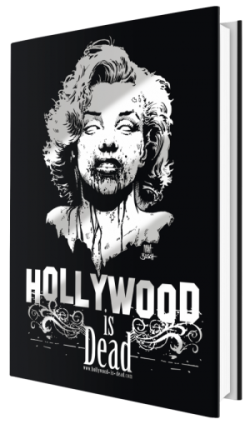 Previously, all of the Hollywood-is-Dead art prints have been produced as 13″ x 19″ limited editions. It’s a great size. Larger than cheap laser prints, but they don’t take up too much wall space, the idea being- you can collect them all. But one of the biggest comments left about this image is, “Why don’t you have this as a full-size movie poster?” Well, now the time has come! Nab the full size 24″ x 36″ movie poster edition of THE LIVING DEAD STRIKE BACK with all it’s serene projectile blood vomit love. The posters is a beaut- and belongs on your wall! All prints come signed by artist Matt Busch, rolled and wrapped in plastic before shipping in sturdy cardboard to arrive safely to your door. You can order one by going to direct to the Online Store page below! Great items from you, man. I’ve bear in mind your stuff prior to and you’re simply too great. to care for to keep it sensible. I can’t wait to learn far more from you. That is really a great web site. surface issue, everything might be acceptable. Hence, if majority of a wall is infested, it will. Nice twist on the poster.